The stadiums in Sochi are ready to host the Olympic Games and will provide a comfortable and unique experience for visitors. Organizers have proudly announced that the venues for the Olympic Games in Sochi will be the most compact in history. The two stadiums that will host the hockey games—Bolshoi and Shaiba—are literally a couple hundred feet away from each other. By comparison, to watch the hockey team practice in Vancouver, spectators had to travel to the other side of town. A trip to watch the speed-skating events at Richmond Ice Center took an hour and a half each way. In Sochi, if you want to watch the stars of speed skating live, the walk is just five minutes from the main press center. In general, organizers have made it very easy for journalists to work in Sochi Olympic Park. Having all of the arenas located so close together is also a big plus for fans. All of the stadiums where the medals will be awarded are finished; each of them has been put through several test events. The only stadium in the park where construction is ongoing is the Fisht, which will host the opening and closing ceremonies, as well as the medal ceremonies. The latest arena to host a test event was the Shaiba. The Four Nations Sled Hockey tournament was recently held here. Since then, the 7,000-seat stadium has not sat idle. The Canadian women's team is training there before their two exhibition games against Russia, which will be held in Sochi. "Our stadium is very cozy and homey. It is comfortable inside, it has modern climate control, and the ice is of good quality," says Sergei Tutushkin, a representative of the construction company. According to Tutushkin, "The arena is unique in that it is adapted for people with limited mobility. There are many places for people with disabilities around the whole perimeter." Initially, Shaiba was built with the expectation that it would be dismantled and transported to another location. In the end, it was decided to leave the arena in Olympic Park after the Games. "They calculated that it would be impractical and expensive to move it. It is great that the arena will stay in Sochi. There will be children's health center here," Tutushkin says. "The children will stay, of course, in a different place. The stadium will become a training ground where we will prepare our future champions." While they are playing hockey in Shaiba, its "big brother," the Bolshoi, is preparing for something quite different from a sporting event. 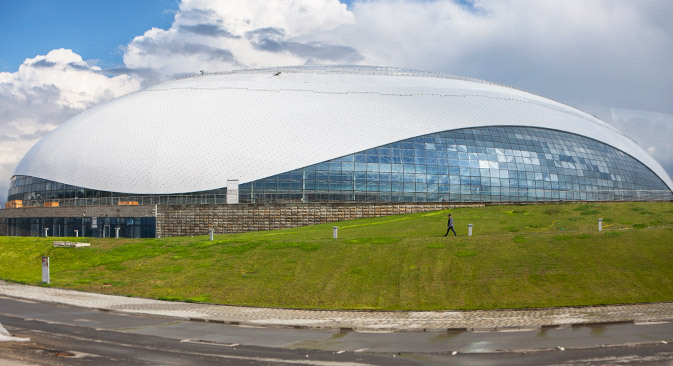 The 12,000-seat arena, which looks like a flying saucer, will host the Sochi 2013 International Investment Forum on Sept. 26. "This once again shows the versatility of the arena: We can accommodate not only sports events. It can function as a concert hall and as an exhibition center," says Natalya Cherepanova, a specialist for Bolshoi Ice Arena organizational services. The seats in the Bolshoi are upholstered with fabric—a nice feature for the fans. Unlike traditional plastic seats, the fabric ones will protect against the cold. The fabric seats are not the only feature they are proud of, either. "This scoreboard cube weighs 22 tons. It is unique in that it was designed specifically for the Bolshoi," Cherepanova says, pointing to the huge cube hanging directly over the center of the ice. "It doesn't have one single face; the corners are rounded, which allows it to project 360 degrees. Video replays will broadcast everything that is happening in the stadium and beyond." Another feature of the Bolshoi is its 12 dressing rooms, eight of which are located in the main arena and four in the training hall. Each team in the Olympic hockey tournament will be assigned their own locker room. The Russian national team has already picked theirs. Adler Arena, the site for speed skating, is the largest sports facility in Olympic Park. Even outwardly it is designed so that its intended purpose is obvious. After the Olympics, it will be an exhibition hall. For now, however, ice-making experts are in charge, maintaining the ice surface in perfect condition for speed skating. "The ice sheet has not melted since last November, because, unlike in ice hockey or figure skating, the older the ice surface for speed skating, the better. It is denser and has less air in it. Every day, the ice makers remove a thin layer and pour a new one," says Dmitry Grigoriev, the head of Adler Arena. It is not warm in Adler Arena. The air temperature is kept at around 15–17 degrees Celsius (59–62.6 degrees Fahrenheit). This is considered the optimal temperature for an ice rink. During the Games, the stands will be 3–4 degrees warmer (5.5–7.2 degrees Fahrenheit). However, this will not affect the quality of the surface, because modern ventilation systems create a curtain of air between the stands and the ice track. The roof of the speed-skating arena is covered on the inside with a silver material that resembles tinfoil. According to Grigoriev, "It reduces the heat transfer from the roof to the ice by almost 10 times. The arena itself is like a thermos. The walls, glass and roof all assist the ice makers with climate control."